”I have now signed all three drivers in the Ferrari 550 for Le Mans,” comments Rob Schirle. All three are British drivers. All three have raced at Le Mans before. Two have driven together before. One is from the north, one from the middle one from the south! One has driven the same car before. “A free Russian Age Racing Race shirt for the winner.” Claim it from Rob at Le Mans, with your three drivers listed on a piece of paper, having signed and dated your entry. 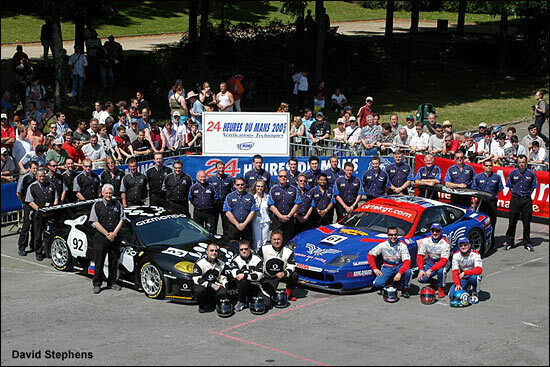 Here's the Cirtek group from Le Mans last year. So none of the three Brits raced this 550 in 2005.